Thankful for summer nights full of scriptural truth and hope. 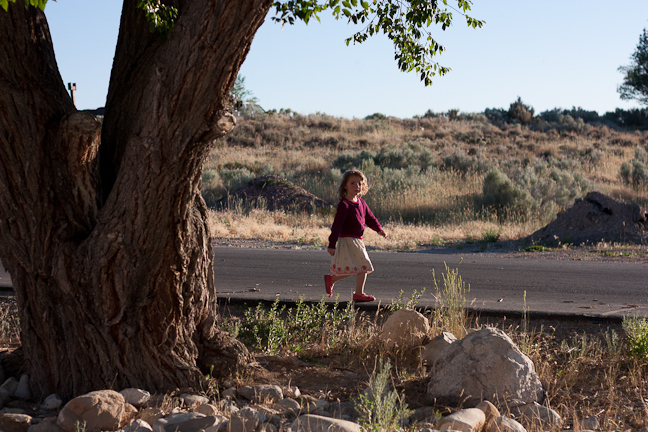 A few pics from last night – love these little Nephites! 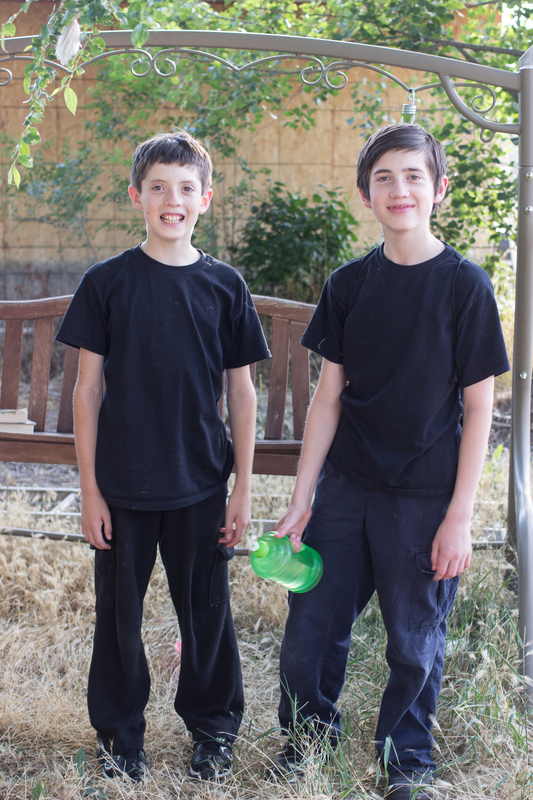 And the ninjas behind the scenes – Jacob and Josh – helped their Grandma Pipes this year with props and sets. Their favorite part? Shooting off the fire in the storm scenes right before Christ comes to America. Makes me smile. Those would be my boys!! 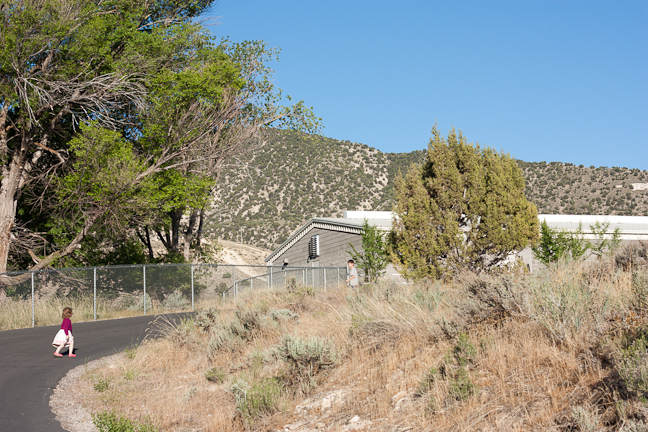 On June 12th we parked in the temple parking lot and started up the curvy path to the costume building to get our costumes for the year. At the turn the costume building peeks up. 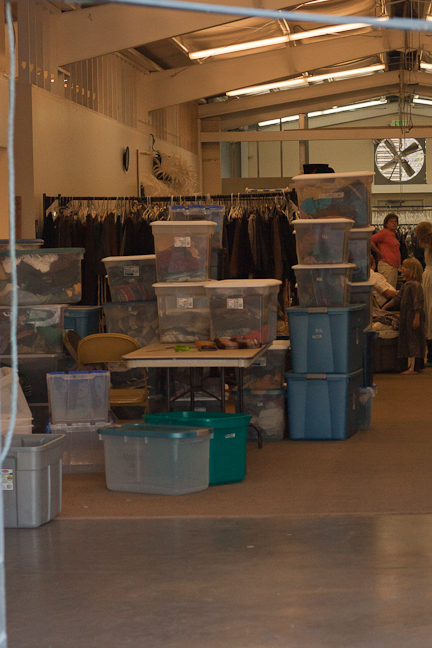 It is a big building – full of costumes, changing rooms and areas for make-up application. Katey just saunters on in. 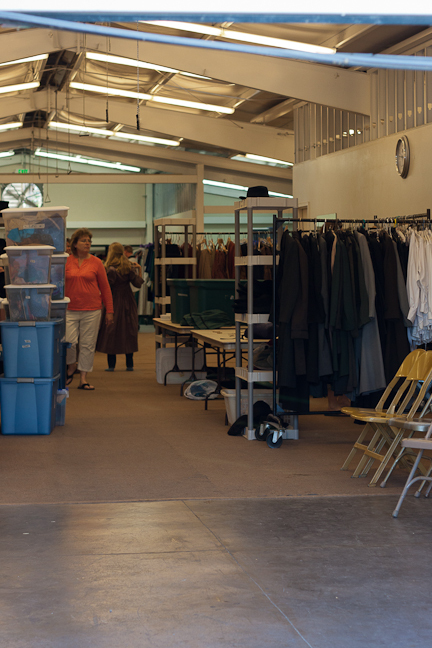 After being assigned, the costumes are kept on a hanger with a number for the person wearing the costume. They are kept in the coordinating section. We were given Nephite costumes by Cheryl. She was so sweet and patient to help pick out all the right sizes for our family. She even let me come back and dig through what was left for my costume. Colorful is what I was going for. Later I realized I would need to nurse in my costume, so I was glad it was a shirt and skirt instead of the initial dress selected. 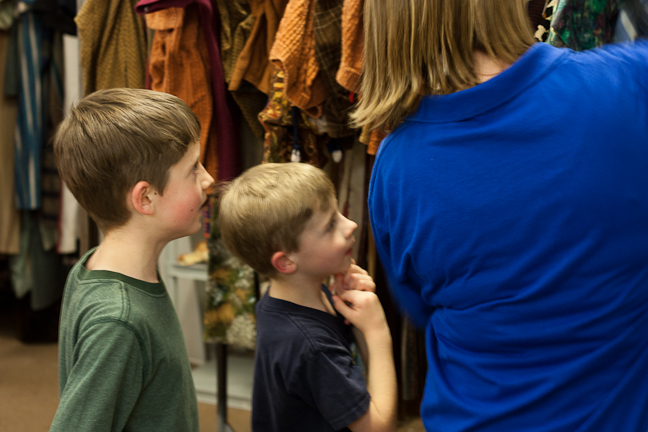 Photos of costumes will be in the next post, but I wanted to share these two of Andrew and Josh helping pick out their costumes. 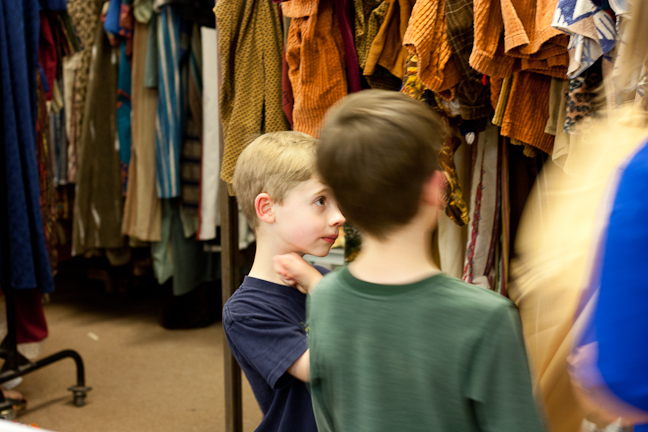 A feel can be had for the rows upon rows of costumes. 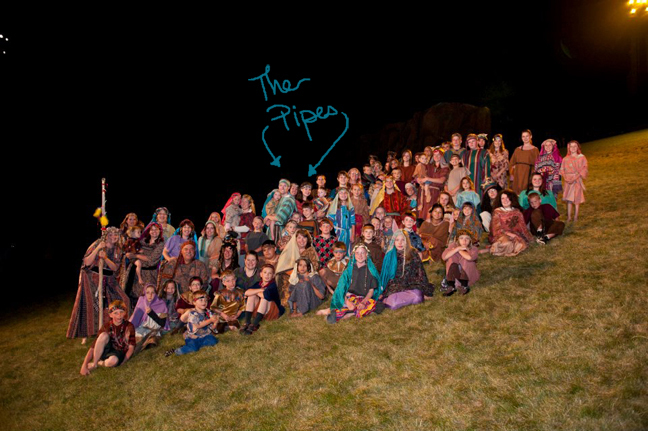 Almost the whole cast is in the Christ in America scene so they have close to a thousand Nephite costumes. Incredible. Big families get to keep their costumes all together in big totes for easy access. The totes are numbered and placed in the front – across from the New England costumes. This year we were #40. We dressed in shorts and t-shirts and the costumes were placed over. Makes changing in public modest and easy. 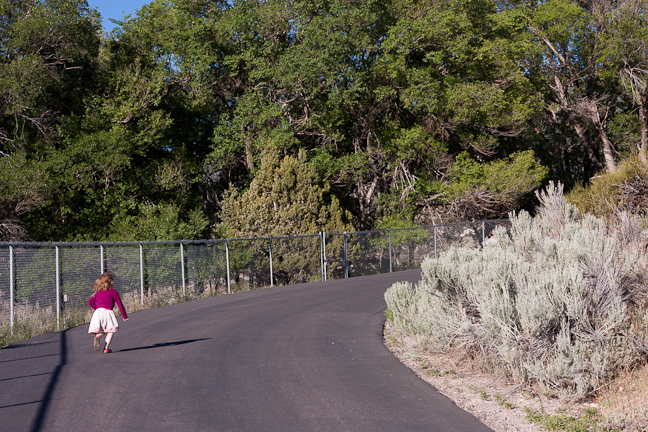 Finished with our task, we headed back down the hill for practice. Katey led the way. This morning the older ones got up early (6 am) with Jim Bob and set up approximately 14,000 chairs on the temple lawn (with lots of help from others 😉 ). A huge undertaking – and always well attended. The task was done in about 1 hour 15 minutes. Such a responsible young man. 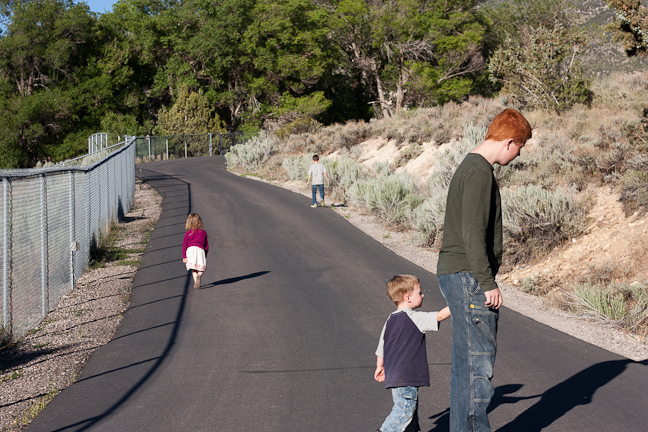 He rode a bike up to Temple Hill and got helping. 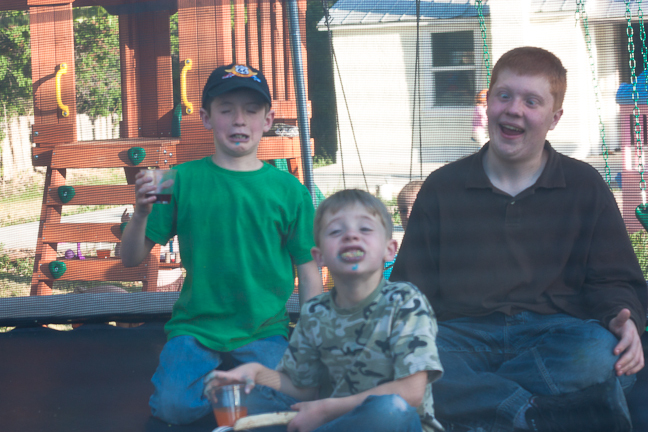 Brendan is in the upper left of this photo. 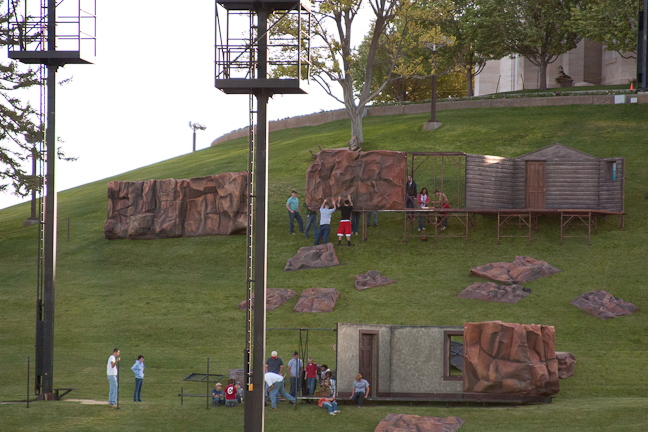 The sets stay looking like rocks during most of the Book of Mormon scenes and then unfold to show Joseph Smith’s home, Carthage jail and a pioneer home. Here it is in progress – so you can see a bit of it all. Another fun part of the set is the volcano that rotates to reveal a temple – very neat. That one is moved on and off the hill each night. Who takes care of all the sets and props during the show? Well, there is a crew for that too. 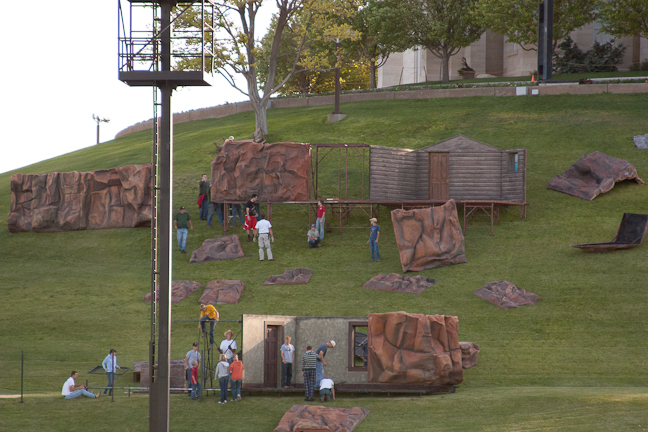 Fifth from the left is my Mom Pipes – she is amazing running all over the hill – moving sets and carrying props here and there. She’s at it again this year. Third from the right is Jim Bob’s (and therefore mine too!) brother John. 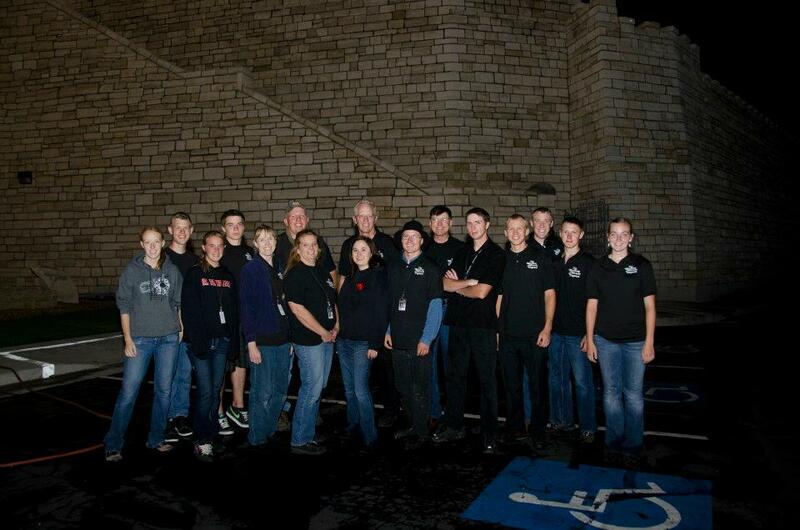 Last year he was stage crew for half the nights and Angel on the Temple for the other half. We sure miss him this year, but he’s living a good life freshly married. 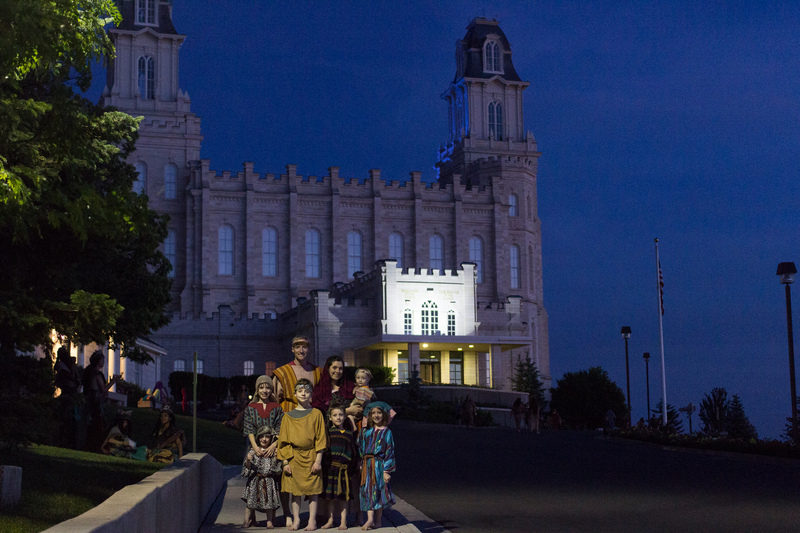 So many ways to help out with the Mormon Miracle Pageant. This week will be filled with new posts about Pageant- I promise. I have a whole list. Brendan helping with the scenery set-up, a tour of the costume building, words from the opening fireside and a few food posts mixed in as well. Practices are going strong. 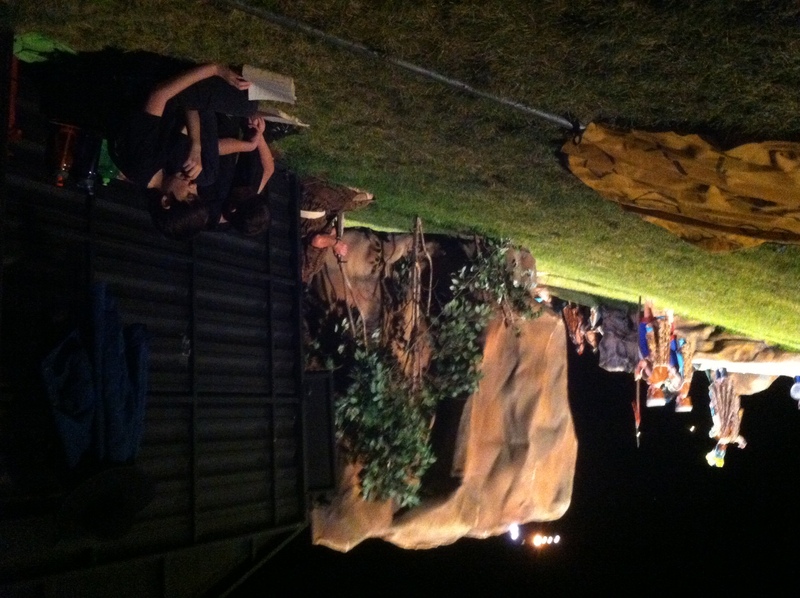 Brendan has practice twice a night… once with the assistant directors and once for the main director. 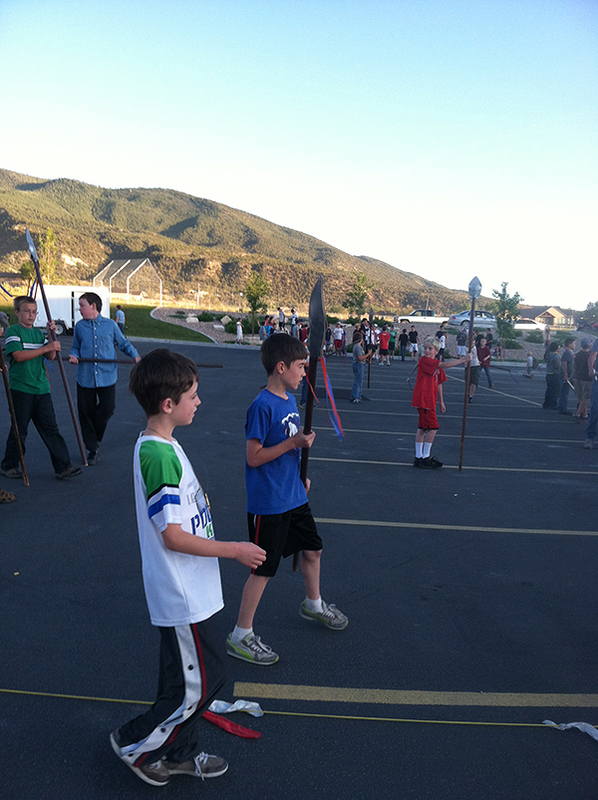 Jacob has one practice per night – in the parking lot of the church. 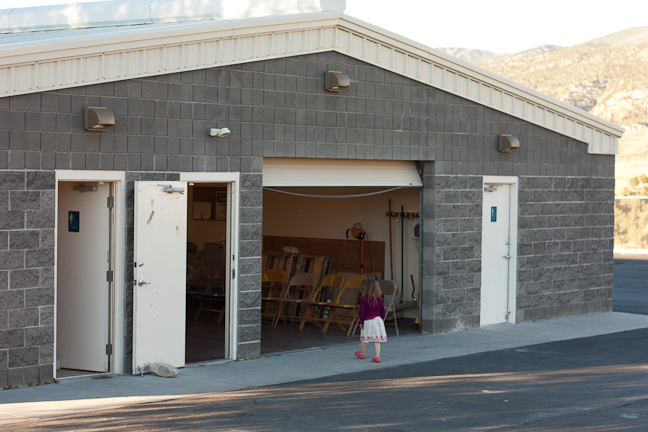 They both started Tuesday and our family part started tonight, by the pavilion behind the church. This is the first year that Jacob gets to be a warrior in the pageant. He is a Nephite Standard Bearer from the Book of Mormon. 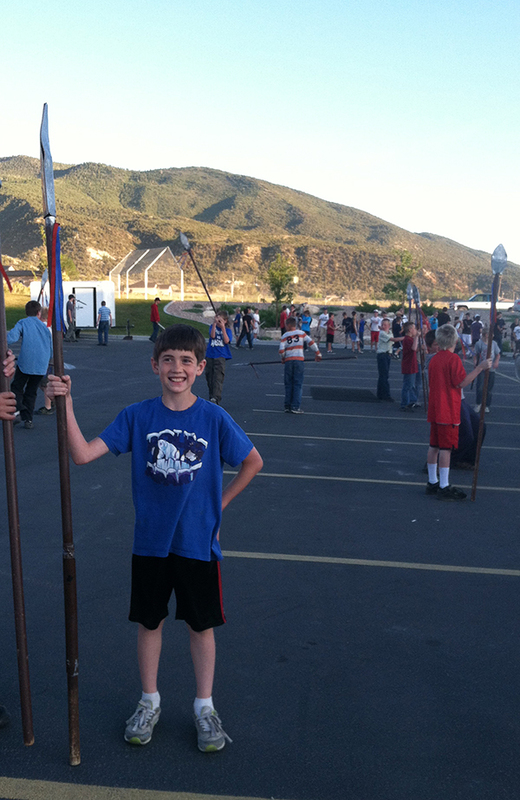 He’s pretty excited about being a righteous warrior… and getting to wield a spear. Me thinks his brother is looking forward to two years from now. 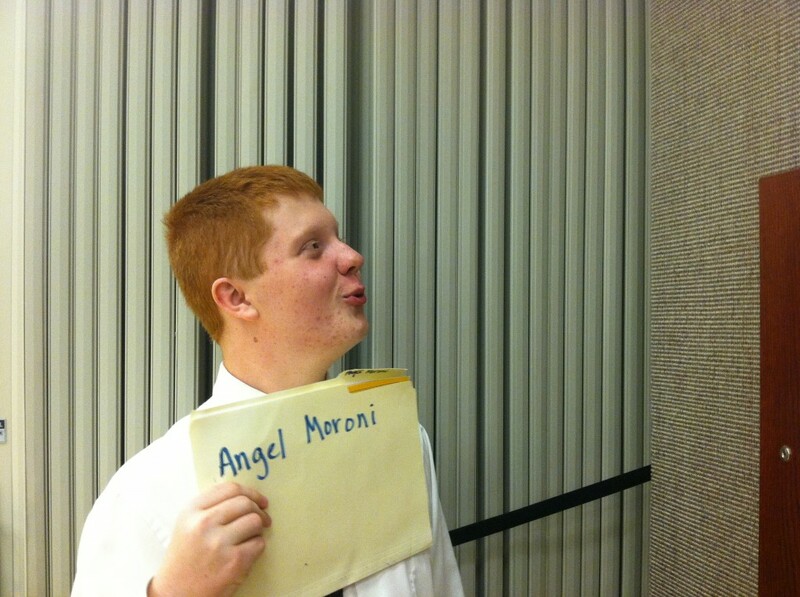 Brendan will be portraying Angel Moroni’s Night Visit and when Joseph Smith sees the Golden Plates – alternating nights. I found out a little more about the process of casting. I visit teach one of the assistant directors and during our visit she explained how it works. After the call backs on Wednesday the directors all discuss the parts with each other. Many people try out for multiple parts and so coordination is needed. Prayer is involved. 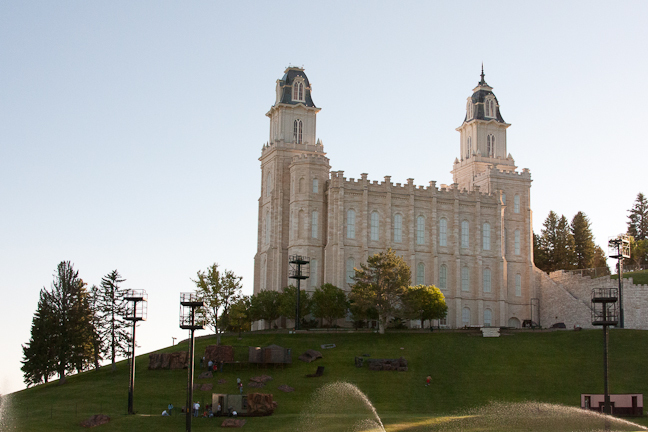 The directors all go to a Saturday morning session at the temple and then meet that evening to discuss again. She said the process is really neat to watch – as the puzzle pieces just start falling into place and everything works out. 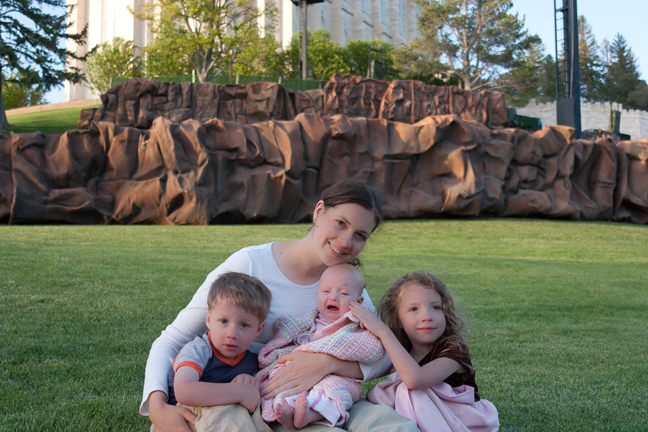 Just one of the miracles that take place with the Mormon Miracle Pageant. We’re all excited for Brendan. Practices start tomorrow. Brendan said his second audition went well. He said he did better – “his best”. And now we play the waiting game. Not only do we have to wait until Sunday evening to find out what part Brendan has – we have to wait until after the opening fireside when they post the pages on the doors in the back. It’s brutal, but thankfully there is plenty to keep us busy. 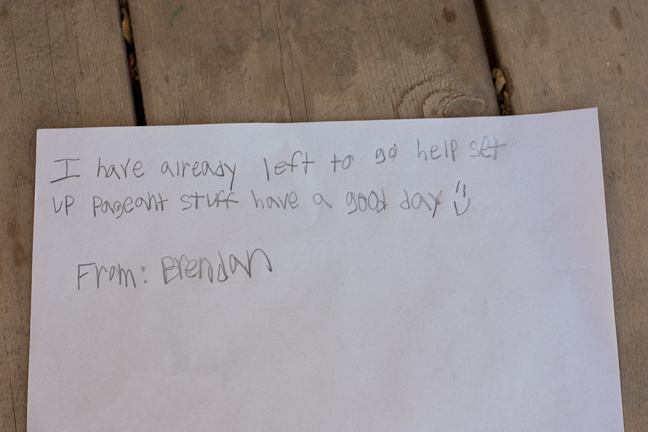 Here are a few of the reasons we love having Brendan around. 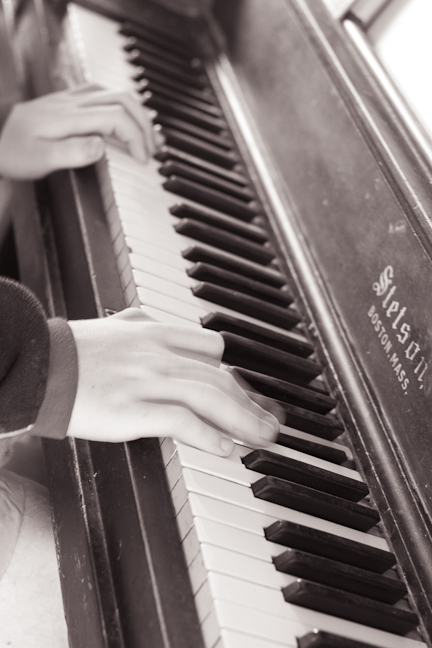 *He plays piano. Often. I really enjoyed “Canon in D” today as well as “Can’t Fight This Feeling”. A few days ago he played an original composition and asked for my feedback. He wanted to know if the middle needed a little extra something. It was amazing – as is. *Almost every time I turn around Brendan is scrubbing something. Walls, all sides of the fridge, stove, dishwasher, all the piano keys… our house has never glowed like this before. It too is amazing. *Brendan bought treats to share. While they love the tootsie rolls & Mike and Ike’s – the overall favorite is the box of Bertie Botts Every Flavour Jelly Beans. There are yucky flavors like earthworm and rotten egg. I got off easy when he gave me grass. It tasted… weird. I hear the others were disgusting (between fits of giggles). Everyone gathers around on both sides (and even leave their vintage game boys 😉 ) to hear the latest installment. Brendan, however, is trying out for some big parts. He auditioned for Samuel the Lamanite and young Joseph Smith. While Brendan was waiting his turn to try out for young Joseph he watched the one auditioning in front of him while Jim Bob gave pointers. At one point the recording talks about how Joseph looks around and is uncertain. Brendan’s response? “Well, that ought to be easy.” With a big old smile. Jim Bob said he did so good though. Confident and sure. Call back time for Brendan is tomorrow at 3:10 pm. This time it will be in front of the director. 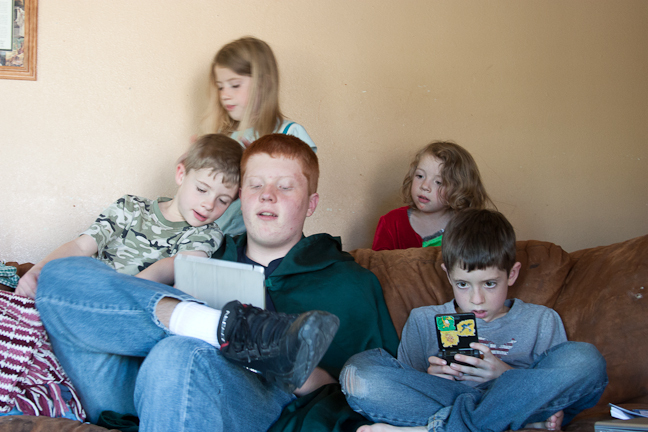 After breakfast, scripture study and chores the boys have been together almost all of today. This morning they watched turkey vultures (first thought to be eagles) in our big willow tree from the backyard treehouse. 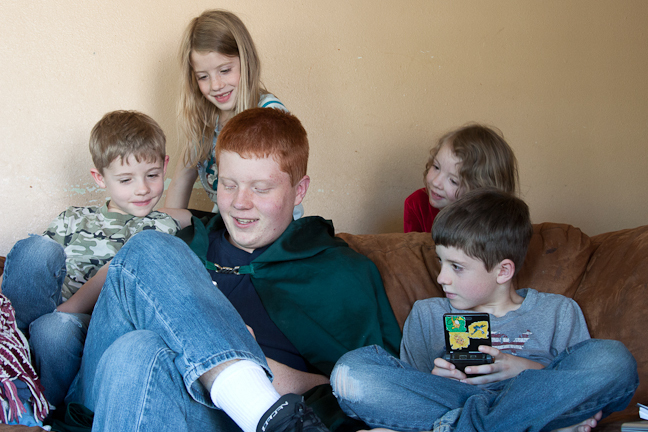 A few video games, lots of planning and talking, some legos and cards… just time together. This evening we went to Ben & Holly’s place for a Family BBQ. We ate delicious food, visited and played. 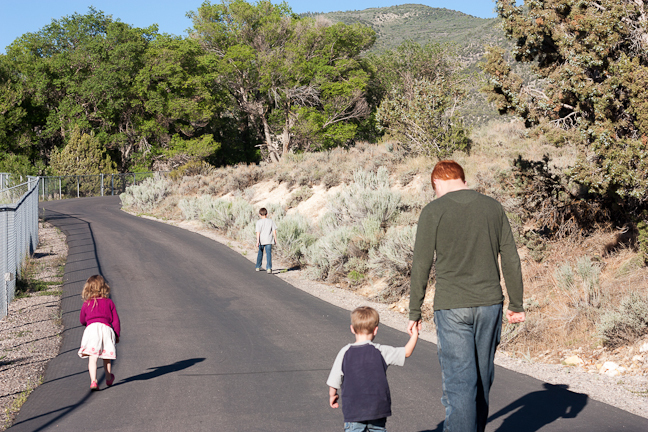 Ben got a four wheeler not too long ago – so short, low-speed rides were in order. Multiple short, up the street and back, low-speed rides enjoyed by many. Not bad for a first day. 😉 Brendan helped crack the eggs for breakfast. He politely asked if it would be okay to try cracking eggs against each other – with finesse I believe he called it. We were making plenty of eggs so why not? Tomorrow night is try-outs. Jim Bob let Brendan in on little details tonight – like how to act out parts big – most of the audience is quite a ways away. They also talked about the parts he will be trying out for and some experiences Jim Bob has had when trying out. More on that tomorrow. 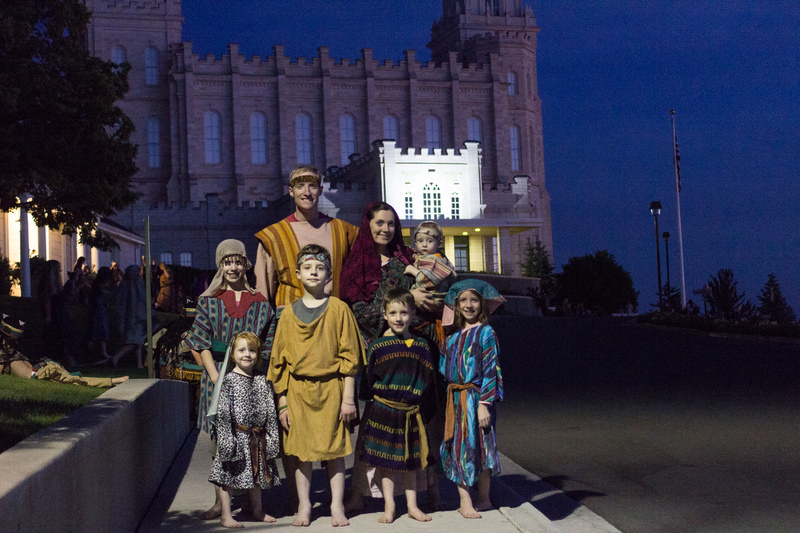 Today is the last day to sign-up to be in the Mormon Miracle Pageant. Today is also the day our nephew comes to stay for the month of June to be in the pageant. We are so excited. 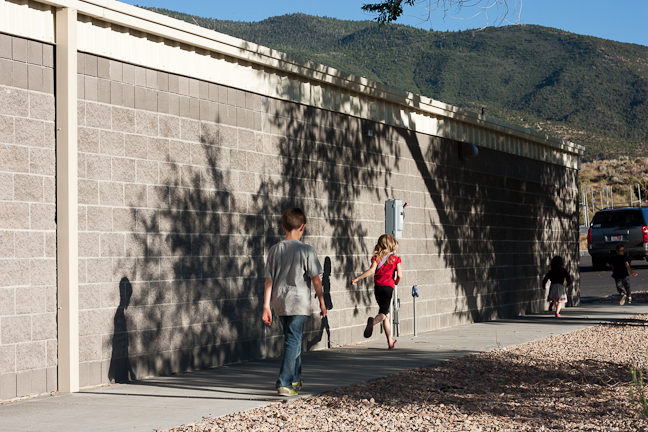 The last day of school was last Thursday. Which all means, summer has started and it’s Pageant Time. We added two this year – with Meri being born and our nephew Brendan coming along for the ride. 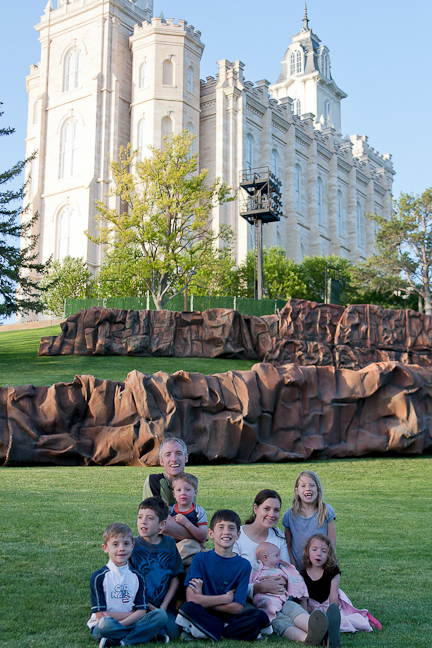 This year is our 5th year in the Mormon Miracle Pageant. It is also the year to document the process – from tryouts to the performance. Partly because I have always wanted to and partly because this year Brendan’s family can follow along and be a part of the whole month. Everyone is welcome to share in the story and everyone is more than welcome to come see the pageant as well. 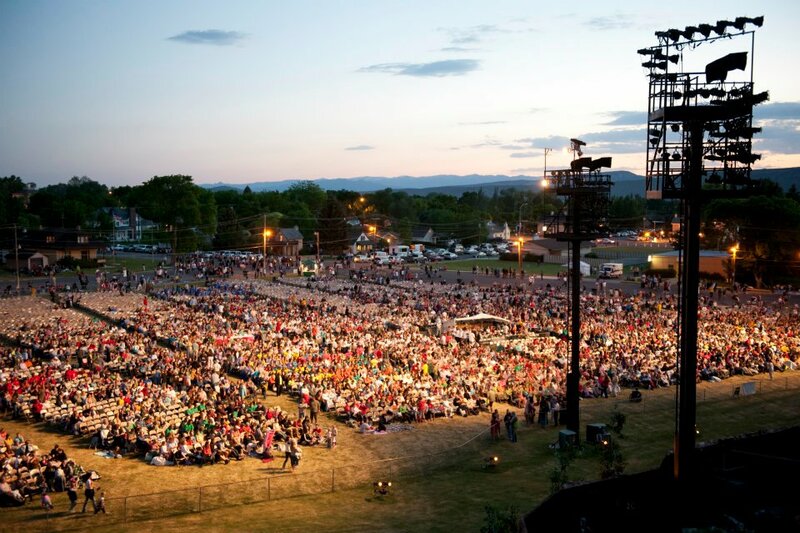 We will be performing the evenings of June 21-23 and 26-30.